The first fall after Michelle moved to Texas, she woke up one Saturday and asked me where we could get a sack of oysters to shuck ourselves. You mean oysters aren't born on a tray of ice with lemons, crackers and cocktail sauce? My first thought was, why in the deep blue sea would I do that when I can get a bartender to serve me some ready to eat? I'm in business for myself. I believe in outsourcing. I'm happy to pay for someone else to jab a steel blade into their own hand for my eating enjoyment. Hell, I've never even shucked an oyster before, but I wasn't totally ready to admit that to Michelle just yet. Its not like she makes it easy when she discovers she has one on me. It was agreed that I would let her show me how to shuck an oyster if I could be in charge of the thermostat - for a few days anyway. So on a splendid Saturday afternoon we hit the seafood market, came home, had some friends over, and shucked some oysters. We ate most raw, char grilled a bunch, and deep fried some. It was great fun. But then came the comments from the Florida girl. Noise about where she is from and how our Texas oysters were okay. Okay? What the hell are you talking about woman? We're Texas dammit! Do they even know how to spell oyster over there in Florida? Things might have gone better for me had I not said that. The conversation flipped on me before I knew it. Next thing I knew Michelle wanted me to explain why the Gators were winning more national championships than the Longhorns. Talk about low. These are not the easiest times for a Longhorn fan to be living with a Gator woman. Michelle was born and raised in Panama City, FL. which is smack dab in the middle of what she says are the best oysters in the world. Her claim is that Apalachicola Bay oysters have no equal. East bay and West bay oysters are also superior in her not so humble opinion. I didn't believe Michelle until we went to Panama City and visited several of the local joints serving freshly shucked oysters. Places like Hunts Oyster Bar, Gene's Oyster Bar, and Gandy's Oyster Bar know their oysters and seafood. It took a lot of work and talent for me to appear not to be impressed with Florida oysters after demolishing four dozen. The pride of Texas was riding on my back so I was still playing hard to get. 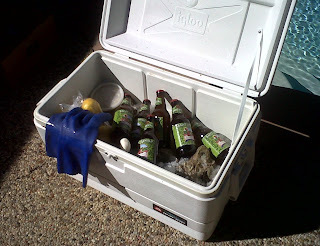 Perhaps the best oysters and where I finally caved, were the ones from the ice chest on her grandpa's back porch. It's realy really hard to express the pain associated with admitting that she was right about them oysters. 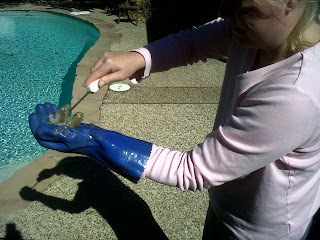 Michelle comes from a long line of oyster shucking pro's. Her Granpa Duds always had a cooler full of oysters sitting on the patio. Papa Duds made his own shucking knives and secret hot sauce. You could borrow them while visiting, but don't even think about taking them from the Dudley homestead. Michelle's aunt Renee and her dad Greg can out shuck anyone on the gulf coast, so Michelle has got some serious shucking game man. 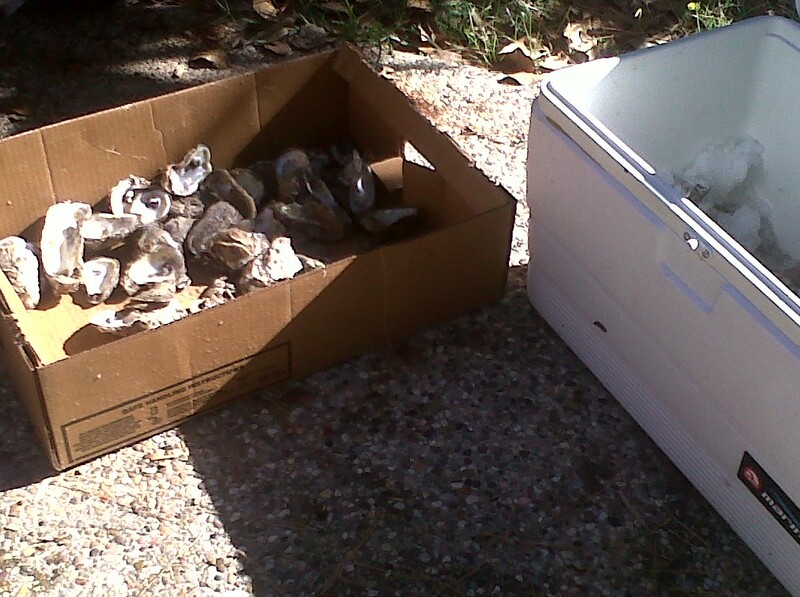 On this most recent and equally splendid Saturday, we grabbed a sack of oysters that came out of Matagorda Bay. 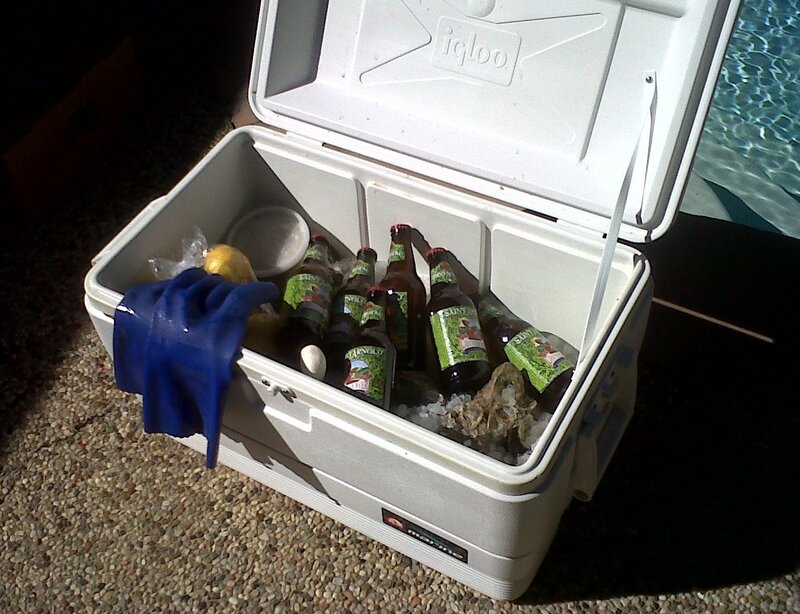 We sat on the patio, sipped wine, drank beer, and shucked oysters for hours. This go around even my little Gator bragging, wine sipping, oyster shucking seafood snob had to admit we scored some tasty Texas oysters. They were salty, juicy and just the right size. Shucking oysters is like many things we do in life. After a little while you just get the hang of it and pretty soon it becomes pretty simple. The first day I tried this, I roughed up my knuckles a bit. 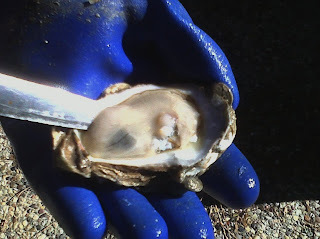 Then I learned that shucking an oyster is 1 part force and 2 parts technique. You learn to find that sweet spot and pop them open, slice the hinge and flip off the top shell. If you are into good flavor, shucking your own oysters has its benefits. Many restaurants rinse their oysters on the half shell to give it a cleaner look. Rinsing an oyster doesn't make them more sanitary, just less tasty. The difference between slurping down an oyster in its natural juices vs one that has been rinsed off with fresh water is undeniable. When we do go to a bar we ask them not to rinse our raw oysters. We get a little flack about that sometimes, but thanks to Michelle I've learned the best way is to do it yourself. Not only do they taste better, its a great way to spend time with friends and family. Have plenty of trash bags handy. Oyster shells can weigh more than you think. What I always find amazing is that hauling off empty oyster shells seems heavier than when I brought them home whole. Maybe its because there is twice as many shells in the trash...he he he. Making a cocktail sauce is all about your taste for heat. A good start is 1 cup ketcup, 1 tablespoon horseradish, 1/2 tsp Worcestershire, 1/2 tsp lemon juice, 1/4 tsp tabasco. Play around with the measurements to suit your taste. Char grilled oysters on the half shell are awesome. Sprinkle a little garlic powder, red pepper, and Parmesan cheese while keeping as much of their natural juices in the shell as possible. Grill them for 10 - 15 minutes. You can't be having Michelle berating Texas seafood or, God Forbid, UT this way. I can accept her thinking her oysters are better than ours but we know different. I think you agreed simply because you lost your 'nads for the moment. To regain them boogers I suggest you take a deep breath and let her know you are carrying your own oysters (mountain ones, however) and you know a thing or two more than she does about them. That being said have a Happy and Safe and Thankful Thanksgiving.